The other day when I was in WHSmiths I ended up buying a copy of Lorraine Pascale’s new book “Bake”. I was only meant to go in there to buy some new highlighter pens and a notebook but I came out with them plus Lorraine’s book and a magazine. I was then meant to be doing my weekly shop so I went across the road and found myself sat in Costa coffee looking through the book. Instead of writing my shopping list I was sat there looking through all the recipes and mentally bookmarking which ones I wanted to try out first. Now I’m not meant to be baking at home at the moment unless it’s for someone else or when I go to my local Clandestine Cake club event. But I can’t help it. Baking is part of me. So I try to make things for others. I sometimes take bakes into schools I work in or give to other people. This is what I did with the very first bake I tried from Lorraine Pascale’s “Bake”. The first recipe I tried from the book was funnily enough also the very first recipe chronologically in the book. It is an easy recipe to try and also looks effective. 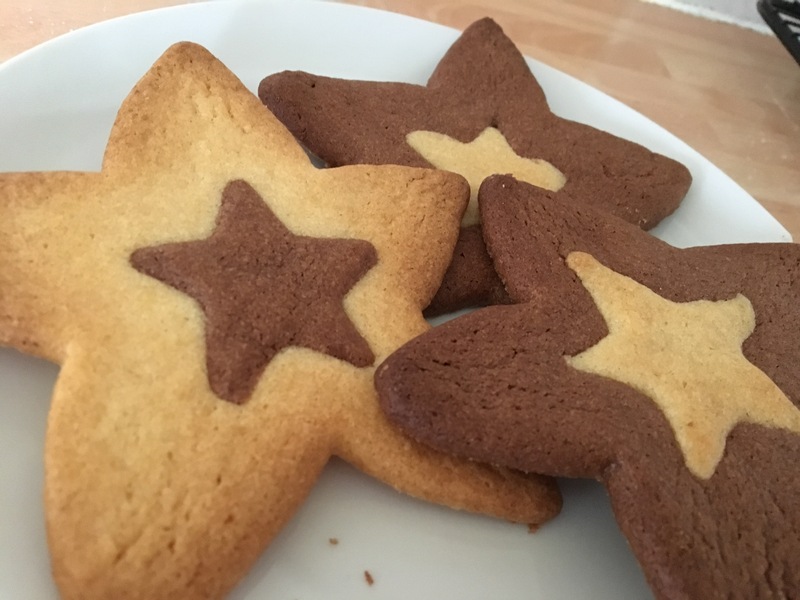 The original recipe was for Chocolate and Vanilla Stars but I adapted this to turn them into Chocolate Orange Stars. Instead of adding a vanilla pod or some vanilla extract to the dough, I used Sugar and Crumbs’ Chocolate Orange Cocoa Powder instead. The first job was to cream together some butter and sugar in a bowl or with a hand mixer. This needed to be done until the mixture was light and fluffy. After this I added in a beaten egg. The mixture was then divided carefully into two bowls. Although I tried to take great care over this and to split the mixture evenly, I still thought there was slightly more chocolate dough than plain dough! To one bowl I added half of the quantity of self raising flour and some cocoa powder. To the other bowl I just added the remaining amount of flour. 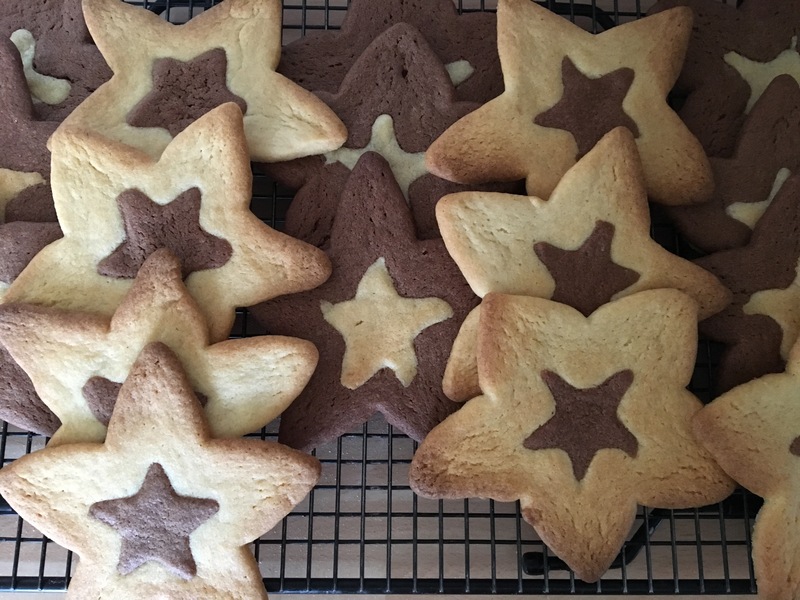 My star cutters looked a bit bigger than the ones featured in the photo next to the recipe but I still had enough mixture. I rolled out the chocolate dough first and cut out the stars. 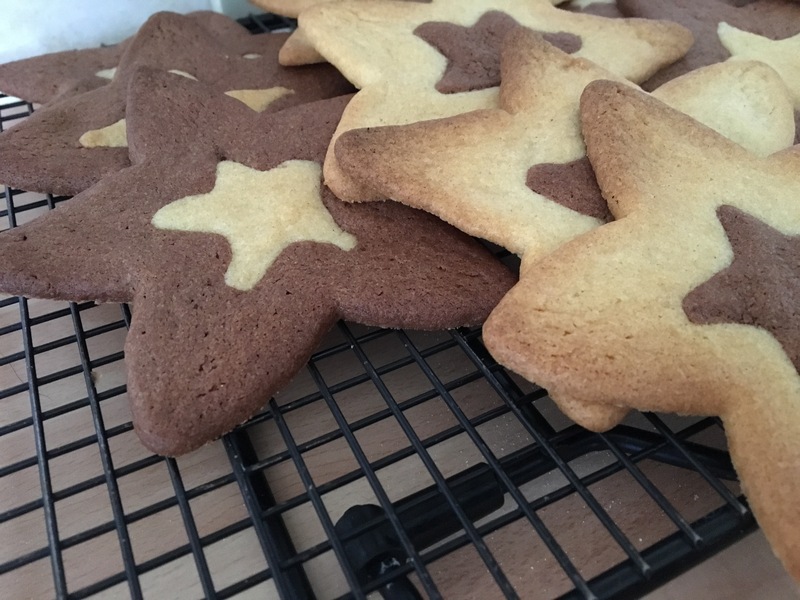 Once all the chocolate stars were cut out, they were laid onto two lined baking trays. I then got a smaller star cutter and cut out the middle of the biscuit leaving a star shaped hole. 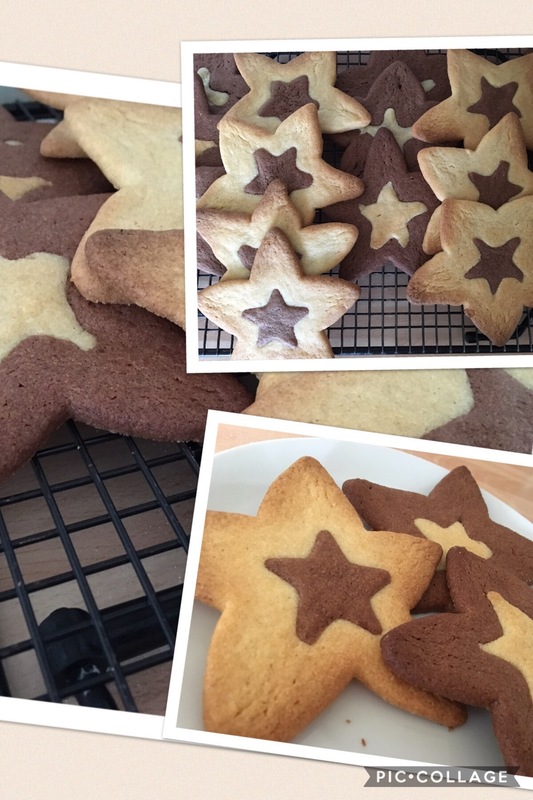 The chocolate mini stars were then put to one side to become the centres of the plain cookies. On another two baking trays I did the same but with the plain dough. When I had cut the stars out of the middle they went into the middle of the chocolate ones and vice versa. I had to bake the cookies in two batches as I needed four trays and I can only fit two trays in at a time in my oven. They expanded in the oven and puffed up slightly, maybe because the recipe asked for self raising flour rather than plain flour. Once cooked in the oven after about 10 minutes I let them cool down on a wire rack then planned to get ready for work. When I was about to go out of the door I would put them into a box. That never happened. Just as I was getting ready to leave my phone rang so I was locking up and getting my things together. I left the boxful of cookies on the worktop and drove off to work. Over the next few days they got eaten at home. Previous Post Strawberry Milkshake Traybake. Next Post Pancetta, Cheddar and Chive Scones.